You're 18, right?. Original 画像 belong to Universal Pictures, アイコン によって DarkSarcasm.. 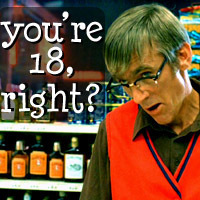 Images in the Dazed and Confused club tagged: dazed and confused image icon liquir store clerk david blackwell. This Dazed and Confused icon might contain タバコ店, たばこ店, たばこ, タバコ屋, and たばこ屋.